A high-quality diet is important to all dogs. Most importantly for the Cocker Spaniel, a healthy diet will help keep their minds sharp, their disposition happy and it will keep them active well into old age. Cocker Spaniels are one of America’s favorite breeds. These sweet and cuddly dogs are a medium-sized breed. They have soft fur that is perfect for cuddling but they are also athletic and can be a fun, and playful partner. Their coat is one of their most distinguishing qualities. With some extra grooming care and the proper nutrition, you’ll be snuggling up to these softies for many years to come. Their long ears are another trademark. Originally used as sporting and hunting dogs, Cocker Spaniels are intelligent and easily trained. Male Cocker Spaniels will weigh around 25-30 pounds and stand 14.5-15.5 inches tall. Female Cocker Spaniels typically weigh 20-25 pounds and are 13.5-14.5 inches tall. Their life expectancy is between 11-15 years. A diet that promotes a healthy coat is especially important to a Cocker Spaniel. Their long coats are a beautiful trademark that requires a little extra attention, grooming, and nutrition to stay healthy. They are prone to some allergies and skin problems underneath that lustrous hair. Foods with all-natural ingredients and free of artificial fillers are always a top choice. This is especially important if your Cocker Spaniel has a food allergy. Although a healthy Cocker Spaniel’s average life expectancy is 14 years, the breed has a few common health issues they are prone to. Here are a few common ailments typically found in Cocker Spaniels. Cocker Spaniels have the most adorable brown eyes. Their expressions are part of their signature look and they’ll often have you giving them whatever they desire. If your dog has cataracts, you’ll notice a cloudy spot in their eye. This is a genetic condition that is fairly common in Cocker Spaniels. Because it’s hereditary, it can sadly make an appearance on fairly young dogs, sometimes under the age of four. With routine eye exams and a close watch, you and your vet can typically spot Cataracts quickly. It can be very progressive if it’s left untreated. Surgery is a complicated option, but it can stop the disease from progressing quickly. Older dogs or dogs with a non-hereditary form of Cataracts aren’t good candidates for surgery. While allergies can be found in all dog breeds, Cocker Spaniels may have a tendency to have certain food allergies. When a Cocker Spaniel is allergic to an ingredient in their food or treats, their immune system tries to combat this. This is when your dog will show symptoms of a food allergy. Your Cocker Spaniel may start itching their feet and ears and the skin can be swollen and irritated. Vomiting or diarrhea can be a sign of an allergy or food intolerance in their gastrointestinal tract. An elimination diet is the best way to weed out what is causing the reaction if your dog. Once you pinpoint the ingredient you can switch over to foods and treats without it. Seborrhea is a skin disease that is commonly found in Cocker Spaniels. Your dog will suffer from both oily and dry patches of skin. When skin cells overproduce, you’ll see a combination of dry, oily skin. Vitamins, baths and moisturizers and shampoos made to treat the symptoms of Seborrhea are treatments that have the highest rates of success. Skin problems can also arise due to a food allergy. For Cocker Spaniels, you’ll usually see excessive itching in their ears and feet. It’s common for any number of skin problems to arise in conjunction with each other. If their immune system is down, they may be prone to bacterial infections on their skin as well. It’s important to watch out for signs, feed them a high-quality diet and regularly wash and groom your Cocker Spaniel’s coat to keep skin issues at bay. A Cocker Spaniel’s signature floppy ear needs regular grooming and care to stay healthy. Cocker Spaniels typically love the water, so it’s important to dry their ears thoroughly after a swim. The underside of your Cocker Spaniel’s ears also needs to be brushed and cleaned regularly throughout the week. Because moisture can build up underneath their thick fur, the hair near their ears can attract dirt and even bacteria. If your dog has an ear infection, you’ll notice inflammation or itching of their ears and skin. You may find a bad smell and discharge as well. Your vet can provide treatment and a safe cleaning regimen. With proper care and grooming your Cocker Spaniel can quickly recover from an ear infection and you may be able to prevent future irritation. You always want to look for the best possible ingredients to feed your loving Cocker Spaniel. Your best pal deserves the best to feel their best. With so many food brands and recipes out there, here are a few items to watch out for then shopping for your Cocker Spaniel’s food. Note that the first five ingredients listed are the most important ones. These will have the highest quantity and make up the most of your dog’s food. From there they decrease in quantity. Real sources of protein should always be listed as the first few ingredients. Fruits, vegetables and good sources of fiber should follow. There are some foods you should just always stay away from in your Cocker Spaniel’s Food. For example, always steer clear of dog foods using artificial fillers and preservatives. They don’t provide any nutrition and they are just used as fillers to replace more expensive ingredients. While some dogs need a grain-free diet because of allergies, a grain-free food may not be right for all dogs. Some grain-free foods contain a lot of potatoes. Too many potatoes may be harmful for other reasons. The FDA recently conducted a survey on these foods. Read more about their findings on fda.gov. Foods containing meat byproduct are other recipes to stay away from. 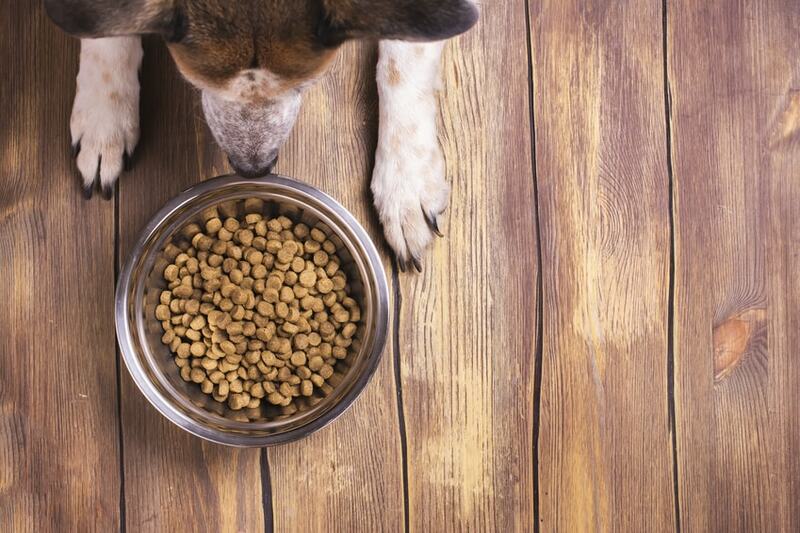 A real source of protein should always be the first ingredient listed on your dog’s food. The Daily Dog Stuff talks about some of the worst foods on the market and what makes them so bad for your beloved Cocker Spaniel. If your Cocker Spaniel is prone to allergies or a skin condition. You may want to stay away from buying dog food that contains common allergens such as soy, wheat, eggs, chicken or grains. These are foods that dogs with allergies are typically most allergic to. Foods containing fillers and artificial ingredients are also harmful to your Cocker Spaniel. Stick to food with high-quality ingredients and your pup will be feeling their best. The food you feed your Cocker Spaniel will vary depending on their age. A puppy and a senior dog have very different nutritional needs and you should feed them accordingly. A Cocker Spaniel puppy should be fed more frequently than an adult. Ideally, you’ll want to feed them three times per day. You should space out the feedings so that they eat first thing in the morning, again late morning, in the afternoon and then lastly around the time you eat dinner. They should be fed puppy food from the time you bring them home until around 10-12 months when they are fully grown. You’ll want to feed them around 3 cups of puppy food a day. Adult Cocker Spaniels don’t need to eat that frequently. Once they start to reach their full size, you can start mixing adult food into their puppy food. You should do this for a week or two until they are acclimated with the new food. Adult Cocker Spaniels should eat around two cups of food, twice a day. You can feed them once in the morning and once when you eat dinner. Senior Cocker Spaniels won’t need as many calories as they age. Dogs tend to slow down in their older years and may not be using as much energy. You can keep them on the same food schedule and amount of food as they had as an adult, but you should switch to food designed for the needs of a senior dog. Some dogs may also only eat once a day as they get older. Use meal mix-ins or food toppers to entice your dog to eat if you’re worried, they aren’t eating enough. With so many dog food brands and recipes on the market, it can be overwhelming trying to decide which one is best. To help you narrow it down, here’s a roundup of some of the best foods for your Cocker Spaniel. Honest Kitchen makes a human-grade dehydrated dog food that you only need to add water to. When food is dehydrated it maintains all of the minerals and vitamins from the original sources. This recipe is made with free-range, real chicken, vegetables and fruits. You’ll find green beans, bananas, apples and pumpkin in this recipe. The food is made in a human-grade facility, so you know your Cocker Spaniel is receiving the top of the line. One 10-pound box will make 40 pounds of food. Ollie dog food makes it so you can feed your dog, fresh, human-grade ingredients without actually cooking the meals yourself. It’s almost as if you have a private chef for your dog that delivers, custom food, perfectly portioned for them, right to your door regularly. Once you answer a few questions regarding your dog’s breed, age, weight, and dietary restrictions, they’ll whip up some recipes that are perfect for your pooch. All of their ingredients are fresh and human-grade. You can store the food in your fridge if you’re ready to serve it or your freezer. The food comes portioned in a recycled container on a regular schedule. This is ideal for dogs with food sensitives or allergies because you can fully customize the ingredients. American Journey provides a quality dog food at an affordable price. With real meat, fresh vegetables and fruit, you can feel confident you’re giving quality food to your dog. The lamb recipe is great for dogs with gastrointestinal issues or food sensitivities. Lamb is easy to digest and full of protein. Salmon oil is also included which is great for your Cocker Spaniel’s coat and skin health. Because they are prone to coat and skin issues, having the essential oils included in this recipe is a huge benefit for this breed. The chick-peas and sweet potatoes in this recipe provide a nice amount of fiber that will help give a proper energy boost to your active friend. Puppies need a special diet designed for their growing bodies. Puppies are active and busy, and they need food that will deliver the energy and nutrients they need. Your puppy Cocker Spaniel needs the right amount of protein, good sources of fiber and vitamins and minerals to promote healthy bone growth. You’ll want to start transitioning your puppy on to adult food around 10-12 months. Start slowing by mixing in small amounts of adult kibble and gradually increase it day by day. The lamb and rice recipe from Nutro is a great starter food. Lamb is easily digested and will sit well with your puppy’s sensitive stomach. There’s plenty of good protein and fat sources to promote healthy development. This food also promotes healthy skin and coat which is vital for your snuggly Cocker Spaniel. This recipe is free from soy or corn and only natural ingredients are used from trusted farmers. Nutro is made in the United States without preservatives or chicken byproduct. Nature’s Variety, Instinct recipe is grain-free and contains freeze-dried meat within the kibble. The freeze-dried meat contains the concentrated protein your growing pup needs. There is raw nutrition, free-range chicken, and DHA packed into every bowl. This recipe is free of grains, potato, byproduct, soy and what. Nature’s Variety is made in the United States and you won’t find any artificial colors or preservatives. Your senior Cocker Spaniel still has a lot of life left in him. You want to give him the proper nutrients to keep him going for many years to come. You should start to feed your Cocker Spaniel a senior food around 10 years old. Since they may have slowed down at this age, a senior food will have a better calorie count for their metabolism. You also want to look for a senior food that contains calcium for bone health. The trout and sweet potato combination by Nulo is a great recipe for your aging Cocker Spaniel. This recipe is grain free and contains 30% crude protein. This formula is full of the lean protein your senior need. Deboned trout, turkey meal and salmon meal are among the first three ingredients listed. There is also L-Carnitine to boost their metabolism and vitamins and minerals to help with joint and hip health. This recipe from Blue Buffalo contains limited ingredients to help keep food sensitivities at bay. It contains real turkey, potatoes, vitamins, and antioxidants. The vitamins included help promote a healthy metabolism, immune system, joint health, and hip health. There’s no chicken, byproduct, eggs, soy, corn or wheat included in this recipe.